This is just a little tutorial I put together to help you out if you would like to knit something in the round, but aren't sure how to get the stitch pattern to work out. I will be perfectly honest - this is not an easy thing for me! It does take me a little while before I "get it" with some stitch patterns. So, you are not alone if you aren't able to convert stitch patterns easily. I do get a thrill when I finally figure out some of the trickier ones, which is what makes me keep trying different patterns. Practice makes perfect - so don't get discouraged if something doesn't work out the first time. Keep trying! Of course I did not come up with this information on my own. This all can be found in Barbara Walker's Second Treasury of Knitting, as well as various other places on the web. Also, Margaret Radcliffe has a new book due out in just a few short weeks, called Circular Knitting Workshop: Essential Techniques to Master Knitting in the Round. I pre-ordered this back in December and have been so anxious to get it, I keep checking to see if maybe it will be released sooner! This book is supposed to have information on converting stitch patterns for knitting in the round, which is the reason I want it. Below are instructions along with a few stitches for you to try out to get your needles wet if you have never converted flat to round knitting. You can print this tutorial out so you can have it in your hands - which I find is a lot easier than having to constantly looking at the computer. There is also a free hat pattern using Star Stitch for you to print out too. Last but not least, there is a video briefly going over the tutorial and I will show you the stitches given in the tutorial. I hope this tutorial is helpful, and that you like the hat pattern. Happy Knitting and Enjoy! I recently received both of these magazines in the mail! You can click the images above for more info, or visit the websites via the links in the "Magazines" tab at the top of the blog. This arrived in my mail box not long ago. I can't wait for the weekend to wrap up in a blanket with a cappuccino and read it from cover to cover! 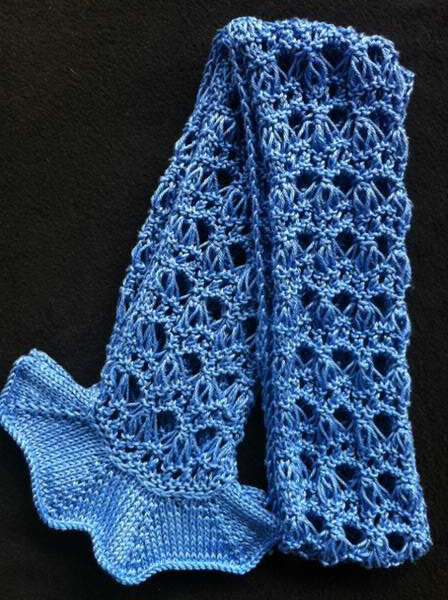 I am pleased to offer this lovely scarf pattern for sale over on Craftsy! Click HERE to go to the pattern. It is $3.50 to download the pattern. The scarf is knit with Cascade Ultra Pima, which is a soft, luxurious 100% cotton yarn that comes in a rainbow of beautiful colors. The color pictured is Periwinkle. There is also a video to help with some of the techniques used in the scarf you may not be familiar with. First up is the simplest and most basic ruffle. It is just a gentle ruffle - nothing too frilly or over the top. 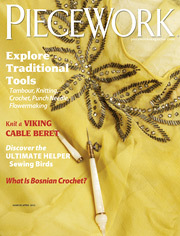 All you have to do is cast on twice as many stitches as you plan to use for your main pattern. 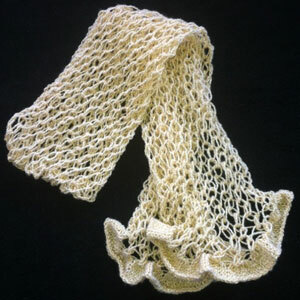 Knit a few rows - I like the look of a stockinette ruffle, but you can certainly use garter stitch if you like; or experiment with different stitches such as seed stitch. After a few rows, you will need to decrease. Just work a row of K2tog - or P2tog even. So for instance, if you plan to work with 10 stitches and you've cast on 20, you will be removing 10 stitches on the decrease row and be left with the 10 you need for your project. Next is a more ruffly ruffle. This one simply expands on the above idea. Cast on three times as many stitches as you plan to use for your main pattern, work a few rows, then decrease. You can simply work a row of K3tog or P3tog as the decrease, or you can flex your knitting brain and calculate how to work the decreases over the next two rows instead of just one. Knitting or purling 3 together can be a little tight/tricky, so you may opt for spreading the decreases out over two rows. For instance, let's again say you want to work with 10 stitches. You have 30. You could work the decreases this way: Next row, *K1, K2tog* along the row. This should leave you with 20 stitches. Next row, K2tog across the row, and you should have left the 10 stitches for your main pattern. 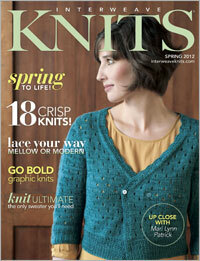 Finally, you can pick up and knit along the edge of a finished piece to make the ruffle. You want to add the ruffle to a finished edge, not live stitches. Ruffles need a nice, firm edge to hold on to. If you add a ruffle to live stitches, the ruffle will spread the fabric out. 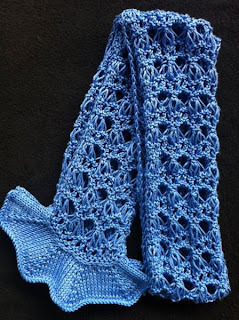 Say you are knitting a scarf and want to add a ruffle to each end after the fact. To make the picking up easier, you may want to use the crochet cast on so that the cast on stitches are clearly defined and easy to pick up. Your standard knitted bind off also created a nice edge easy for picking up and knitting. I'm sure there are other cast ons and bind offs that will give you a nice edge to pick up, but since I typically just use the ho-hum knitted bind off and crochet cast on or long tail, I couldn't give an example of any others. In this particular sample, I picked up 14 stitches along my cast on edge, then knit a few rows in stockinette, then increased big time. I knit into the front and back of each stitch in the next row, as well as making a yarn over between each stitch, totaling 42 stitches. I next worked a plain row and then bound off. This gave me a very ruffly, eyelet edge. You can knit the ruffle as long as you like, but the longer it is, it will turn to a flounce as opposed to a ruffle. It's really all a matter of personal taste. So get out your yarn and needles and start playing. 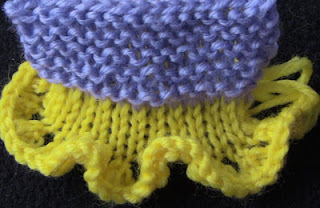 You might like the same method of making a ruffle in one type of yarn but not another. Experimenting is part of the fun of knitting. Here is a video of the ruffles in this post. Happy Knitting!